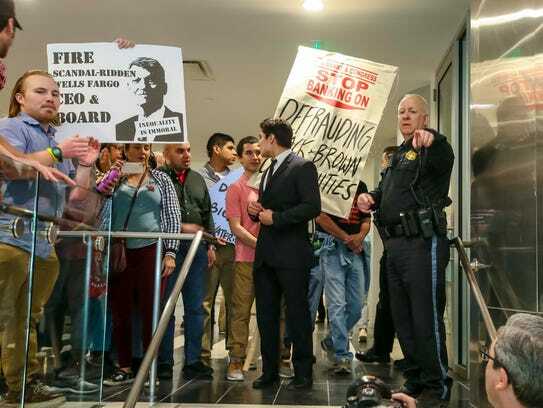 Wells Fargo shareholders and executives clashed Tuesday in Des Moines over the bank’s reaction to a series of scandals that have rocked the financial giant and drawn the rebuke of customers, investors and regulators. “Rebuilding trust is our top priority,” CEO Tim Sloan told investors in a ballroom at the downtown Des Moines Marriott. But shareholders took the CEO and other top executives to task during a lengthy question-and-answer session, calling for the company to rectify its misdeeds and urging leaders to reach deep when making reforms following revelations of systemic customer fraud and abuse. Wells Fargo customers “have lost their homes. 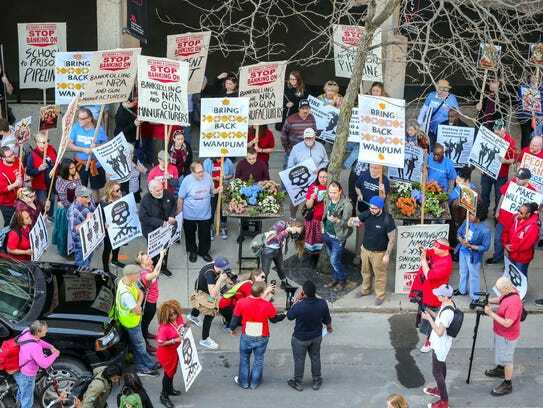 They have lost their businesses, and in no small measure, their dignity, all because our company failed them,” said Nora Nash, a member of the Sisters of St. Francis of Philadelphia and part of a Wells Fargo stakeholder advisory board. Federal regulators slapped Wells Fargo with a record $1 billion fine last week, and the Federal Reserve took the unprecedented action in February of restricting the bank’s growth. Chairwoman Elizabeth Duke said the company had undergone “rigorous self-reflection” and evaluation after shareholders sent “a strong message of dissatisfaction” at last year’s annual meeting. Declines to distance itself from gun-makers and the National Rifle Association. The American Federation of Teachers last week dropped the bank as a recommended mortgage lender for the union’s 1.7 million members. Supports companies that provide payday loans to working Americans living paycheck-to-paycheck. Provides lending to oil companies that have built controversial pipelines, including the Dakota Access pipeline across Iowa. Supports private prisons used to incarcerate a high percentage of minorities and holding facilities used in mass arrests of immigrants. Jordan Estevao, a senior strategist at People’s Action, a Chicago citizens’ action group, claimed the bank’s reforms — including restructuring incentives and hiring 2,000 new risk management team members over two years — put a “nice friendly face” on what has been “economic destruction” for working-class customers. “These aren’t just talking points,” said Sloan, adding that Wells Fargo is the nation’s largest lender, providing the financial fuel that businesses need to grow and mortgages for homeowners. Sloan pointed to Wells Fargo’s commitment to provide $125 billion over 10 years to boost Hispanic homeownership and $60 billion for African Americans. “That’s real,” Sloan said. But Carolyn Raffensperger, an Iowa environmental lawyer, questioned why Wells Fargo could tout providing $12 billion in financing last year for renewable energy, while providing financing for oil companies that have built controversial pipelines that critics say endanger the environment. “You can do better than that,” Raffensperger told executives during a lengthy question-and-answer session. Sloan, asking how many shareholders drove a car or flew to the annual meeting, said the U.S. energy industry is transitioning to clean energy, but it’s not there yet. Sometimes, the exchanges were heated. “Have you disclosed to shareholders how much money you’ve made from doing business with the NRA and the assault-rifle manufacturing industry,” and weighed it against the cost of failing to take action to “address mass school shootings,” Ash said. But he added: “We think this issue is best decided by the American people. We don’t think it’s a good idea to leave it up to banks to decide what products and services that Americans can buy. “It shouldn’t be up to me — to us — to decide that,” Sloan said.